As a means of saying “Thank you for your service” to the police force serving your area, get a group of your neighbors to install these signs. The program works best when you get a group of 10 or more houses to buy into showing support for the law enforcement in your jurisdiction. Groups of 10 get the shipping cost down, the sign cost down & makes a larger impact when Service men and women drive by and half the neighborhood is showing heart felt support. You can feel good about your purchase, knowing that a part of what you are spending will be supporting something local to you. It is our pledge to make a donation of 10% of the purchase price back to a charity that the Department that you are supporting requests. After the first $100 is raised, We will be in touch with each of them to determine what foundation they request. If you do not see you’re department represented then you need to request a custom sign. When placing the order let us know what jurisdiction you need and we will personalize your signs to highlight them! As a means of saying “Thank you for your service” to the police force serving Greensboro, NC, Carla Harper, of west65inc.com , a resident of Greensboro, came to Signworks of NC in Lexington to discuss printing a yard sign to be place in her yard displaying that message. From the initial conversation of printing one or two signs for her yard the idea blossomed into a movement of support for Greensboro law enforcement which has spread not only in her neighborhood but to other neighborhoods and communities in the area. In a time where police and law enforcement are often maligned in the media, we are hopeful that this small gesture of support helps those that serve know that we care and are appreciative of their efforts. 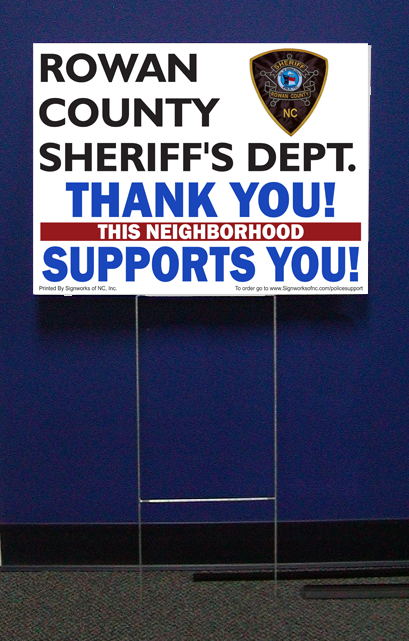 Signworks has joined with Carla to donate proceeds of each sign to local law enforcement charitable foundations. We encourage everyone to show your support for the first responders who have chosen to put their lives on the line every time they put on the uniform.